In a contrast to last week's update, this post will be a super-size one. So much happened this week that I've broken the post down day-by-day. Last Tuesday I decided that the Burial scene was taking way too long and was soaking up the time slot that I allotted for the Dinner scene (which will take a really long time to do since I've made some changes!). So last week I decided to kick into high gear and just get the scene done. Tuesday, the mold pictured in the last post was poured and by Wednesday, I was ready to cast up divers. The parts came out surprisingly easy, despite the amount of detail and undercuts. At this point I decided to go for the max and do a complete set of 7 divers rather than the planned 5. As the parts were coming in, I started blocking out the scene using the helmets that were cast, to figure out where the figures would go. Realizing that the scene would not be viewed in Cinemascope unlike the movie, I was worried that you wouldn't be able to see all the divers in the scene (I didn't want any finished divers to go to waste!). I was able to overcome that problem by arranging them in such a way. This shot shows the divers helmets being used to block out the scene as well as more aluminum coral forms being figured out before they are covered in Celluclay. This photo is actually shot under show lighting and through the 'bubble box' which explains the look of it. Once 63 resin parts were made, they were all grinded down and sanded and sorted into plastic bags for organization. Each bag contains parts for one diver. Thursday was basically assembly day, gluing all the parts together and adding a few wire details here and there for hoses. I changed the positions of the ligaments for variation by cutting the parts and gluing them into the new position and then filling in the joint with self-hardening clay. I also modified two helmets to create Nemo's helmet and the "baldy" one. I temporarily glued all the figures to a strip of wood to make painting easier. After the acrylic paint dried, the divers were all given a wash of clear matte medium mixed with black paint. I was very pleased with how the divers came out. One of the scenes I'm planning on doing is the part where Conseil and Ned stray off from the underwater expedition and get attacked by shark (only to have Nemo come the rescue). 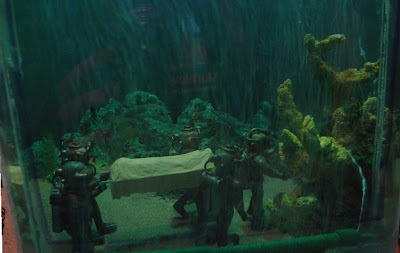 This scene was originally going to be a larger scale, with larger divers, but since I don't want to do more retooling and more molding that I'm thinking I could knock down the scale of the scene to the scale of the Burial scene so I could use the same divers from the same mold as the Burial. It would be a lot easier to do. And since the scale is smaller, I could split the space into two scenes, getting a two for one deal with the same quality scenes. I've definitely got some stuff to think about, though that's for after I do the Dinner scene. The only things that will be different from the photo above is that the viewer will pretty much be where the fountain is (it's going to be a straight on shot) and the expressions of Ned and Conseil will be a little more disgusted because of Nemo's food. When I was planning this scene, I was mainly focusing the scene on the characters. In other words, I wasn't going to build the whole scene; at some point a backdrop would come in to continue the Salon at the end. I wanted a good size scale for the figures, considering I'd have to sculpt them. I didn't have room for an entire Salon scene at the same scale of the figures. I was hoping I'd be able to fit the the whole Salon scene but I couldn't--until I put forced perspective into the equation. 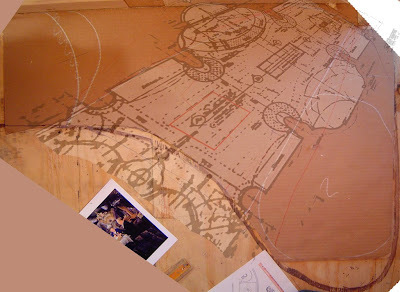 Using a floor-plan drawing of the salon, I mapped out how I could fit the entire Salon on the plot that I had for it. By pinching and squeezing the drawing I was able to fit the entire room on the piece of cardboard. Success! Despite the construction challenges of building this complex scene in forced perspective, this scene is gonna look really cool! Also, Because of the size and shape of the Salon, I ended up creating room for another scene (where the question mark is) that I wasn't planning on doing anyways--Whale of a Tale. 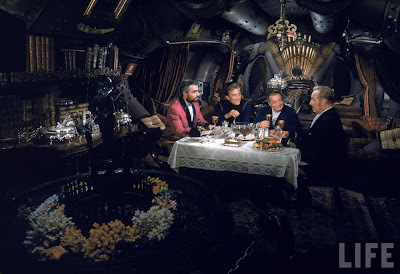 But since I didn't want to tack on another scene to my schedule and I don't know how character sculpting will go on the Dinner scene (plus I really don't want to make all of those sailors!) I have no plans to do the scene, though I will always leave the option there if I want to do it in the future. 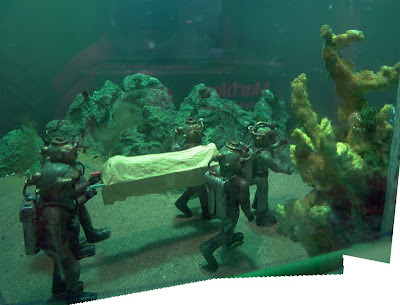 I haven't glued down all the divers yet, so I can position them whenever I want (Nemo, however, is glued down) The extra coral I created helps give the scene a little more depth and looks "fuller". I added some "foreground" coral that goes right in front of the window, like the shot in the movie. It's mounted on a piece of armature wire so I can adjust and fuss around with it if I feel that too much of it is in the shot or too little of it is in the shot. Here's what the finished scene looks like, sans Nemo's coral cross and another bulb in the light box to brighten the scene a little more. Be sure to ignore the 'Marblex' clay box that is reflecting in the plexiglas--I was using it as a tripod at the moment!